The 2012 U.S. Championship and U.S. Women's Championship did not change leadership today, though the two tournaments produced much different levels of excitement. With the two top seeds in each division pulling away from the pack, GM Gata Kamsky exuded his usual perfection in positional chess to give GM Alex Lenderman his first loss of the event. That left the crowd watching to see if GM Hikaru Nakamura, the top seed in the U.S. Championship, could keep pace. After an unusual French Defense led to a stolid middlegame with no obvious breakthrough, it looked like Nakamura and GM Alex Stripunsky would admit the impasse and agree to a draw. After his own game ended, Kamsky looked on from the press room and had a different opinion. He suggested Nakamura prepare his f-pawn's advance, which Nakamura managed in due time. “White has no counterplay and is lost completely,” Kamsky concluded almost instantly. Sensing the infiltration, Stripunsky was unwilling to wait for the inevitable. He sacrificed a piece, then the exchange, then later, with his time running out, another exchange. The final salvo proved too much. Though he engineered a quintet of passed pawns, Nakamura's rook took post on the eighth rank to parry all the possible promotions. Stripunsky saw his pawns were stuck and resigned. After the game, a quick analysis by the players produced a myriad of variations. Enlisting the help of other players produced more questions than answers. “White's winning, no black's winning, no white's winning,” GM Yasser Seirawan said. Kamsky's win lacked similar drama. After repulsing any queenside attacking ideas, he eventually advanced five pawns to the fifth rank in picturesque uniformity. After 18...Bh5, Kamsky said his position was “completely OK.” Then he took a closer look and declared, “Actually, maybe it's not so pleasant for white.” The space advantage, coupled with a belligerent knight, was too much for Lenderman to handle. Kamsky and Nakamura both have 6/8 and will play each other on Friday. Should there be a winner, he will be the betting favorite to win the title. Chasing the two leaders is a trio of grandmasters. GMs Alex Onischuk, Varuzhan Akobian and Yury Shulman all have 4.5/8. Taken together, the top five men comprise the U.S. Olympiad team from 2008, the last time the squad won a team medal. Akobian said he spent 20 minutes in the opening calculating the unusual tactic 8. b4. If 8...axb3 e.p., the queen hangs. If 8...Qxb4, 9. Rb1 skewers the queen to the bishop. But if 8...cxb4 the pawn blocks the diagonal pin so 9. Nxe4 is possible. A possible variation is 9...b3+ 10. Ned2 b2 11. Ra2 a3 12. e4 Na6 (heading to b4) 13. Bxa6 Bxa6. Upon seeing this position, both players liked their position. Ramirez thought the b2-pawn and white's inability to castle offset his material loss. Ultimately, Akobian said he could not accurately evaluate the position, and headed for calmer waters with 8. c3. GM Gregory Kaidanov played his second queen versus three minor piece game, this time departing with the monarch to try his hand with the knights and bishops. Earlier in the tournament, GM Robert Hess trapped Kaidanov's queen on the back rank. This time the queen had more space, but with no major weaknesses for either side, Kaidanov and his former student, GM Ray Robson, agreed to a draw. 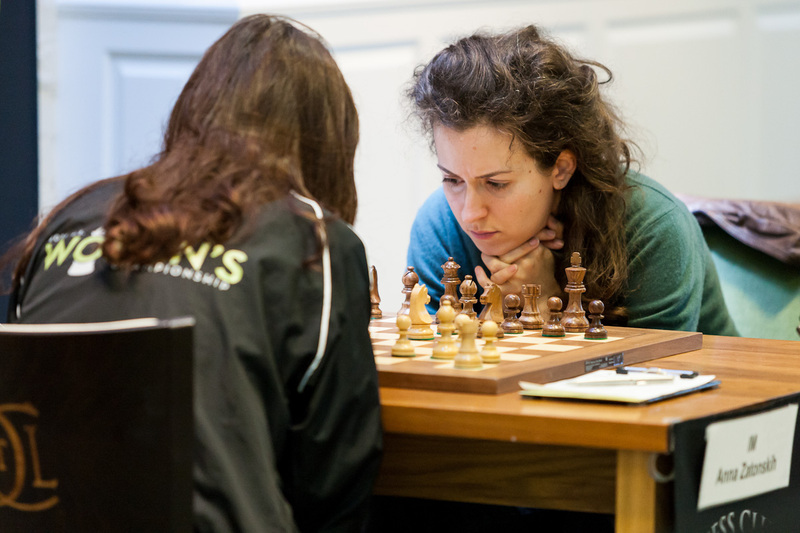 In the women's side of the playing hall, IMs Zatonskih and Krush renewed their annual rivalry in round 7. Though a great majority of the their previous contests had produced a winner, Krush had little incentive to go for an unbalanced game. Playing Black, Krush liquidated the position's energy and the ladies agreed to a lifeless draw. They both still lead with 5/7. Zatonskih regretted the move 12. Bf4, which allowed Krush to centralize with 12...Nd5 and win a tempo. “It is just fantastic how I played this,” Zatonskih said, chastising herself. She was using the literal connotation of “fantastic,” expressing that the move was unexplainable and bad. Afterward, she thought for 40 minutes. The players shared a funny possible drawing line. If 15...a6 16. Nbc3 Nd4 17. Rc1 Nb3 18. Rc2 Nd4 19. Rd2 Nb3 20. Rd3 Nc1 and the rook either returns or goes wandering aimlessly. IM Rusudan Goletiani took sole possession of third place after her win against WGM Tatev Abrahamyan. With a pawn deficit and short on time, Goletiani threw all of her pawns at her opponent's castled king, breaking through for the point. While she does not control her own destiny, Goletiani faces Zatonskih tomorrow as white in a game both women will be trying to win to stay alive for first place. If Zatonskih wins, Goletiani will be mathematically eliminated from title contention. WGM Sabina Foisor was the only other winner of the round. She used the Samisch Variation to beat FM Alisa Melekhina's favorite King's Indian Defense. With king's castled on opposite sides, Melekhina could not open an attack, and eventually ceded control of the only open file. Foisor's rook took control and dominated in the endgame. Foisor is in sole fourth place with 4/7. Round nine for the U.S. Championship and round eight for the U.S. Women's Championship will begin tomorrow at 1 p.m. Central, 2 p.m. Eastern. Come visit the Chess Club and Scholastic Center of Saint Louis or tune in to www.uschesschamps.org for live commentary from WGM Jennifer Shahade and the club's GM-in-Residence Ben Finegold.